The superstitious better say their prayers, because Drowning Pool is bringing the “unlucky” full force. After 13 years, the band is re-releasing their 2001 album ‘Sinner.’ The expanded reissue is a two-disc set with remastered originals as well as 13 demo tracks including “Soul” and “Hero Sleeping”, the last song to be recorded with the band’s first singer Dave Williams, whose untimely death in 2002 at the age of 30 marked an unlucky end to a rising star. The current tour is a chance for new fans to see some of these classic songs live. 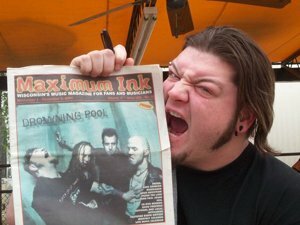 Max Ink caught up with guitarist CJ Pierce out on the road. Pierce also happened to find the very last rehearsal that Drowning Pool had with Williams, which is included on the second CD of the re-release. 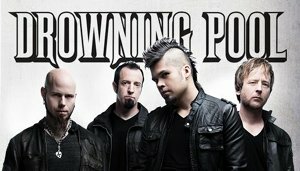 Drowning Pool now consists of Jasen Moreno on vocals, CJ Pierce on guitar, Stevie Benton on bass, and Mike Luce on drums. Although finding a new singer was hard, Pierce believes that Moreno is a great fit. “Everything now is awesome with Jasen Moreno… personally, I was pretty pissed at the fact that we had to keep doing these singer changes. You just want to get the right guy and keep moving forward, ‘cause you love music. But we have that now with Jasen,” says Pierce. The Unlucky 13 Anniversary Tour is providing chances for fans to hear Sinner in a way that they haven’t been able to yet. Drowning Pool is currently touring with Like a Storm- hits like “Love the Way You Hate Me” and “Wish You Hell”- A Breach of Silence, Red Tide Rising, and Imperial Fall. They will be in Wisconsin on November 21st at Route 20 Outhouse in Racine Wisconsin and at the Q and Z Expo Center in Ringle, Wisconsin.